Edith (Mia Wasikowska), a young aspiring writer has a preoccupation with ghosts. Having seen her mother’s as a child, which came with a warning to “beware of Crimson Peak”. This is something that doesn’t appear to have meaning to her until 14 years later. As a strong-willed young woman, Edith is enchanted by a stranger from England, Thomas Sharpe (Tom Hiddleston) who is extremely charming. Thomas is an inventor of sorts and looking to Edith’s father’s company for financing on his latest trinket. Edith’s father grows suspicious of Thomas, and his sister Lucille (Jessica Chastain), as a relationship with his daughter begins to bloom, and pays Thomas to end it. However, the next day he dies by way of a freak accident and Edith is left with only Thomas by her side. Despite Dr. Alan McMichael’s (Charlie Hunnam) worries, and belief that Edith’s father was murdered, she travels back to Lucille and Thomas’ home in England to begin a new life as his wife. The house is old and practically falling apart. Instantly she begins to see things and hear strange noises. The Sharpe siblings insist it’s the house and that she must not go below the main level, for safety reasons. Lucille is very cold to Edith and grows more jealous of the relationship between her brother and their new guest. As Edith begins to fall ill, and the increasing number of creepy things, she begins to investigate into what’s below the main level and just what’s going on with Lucille. 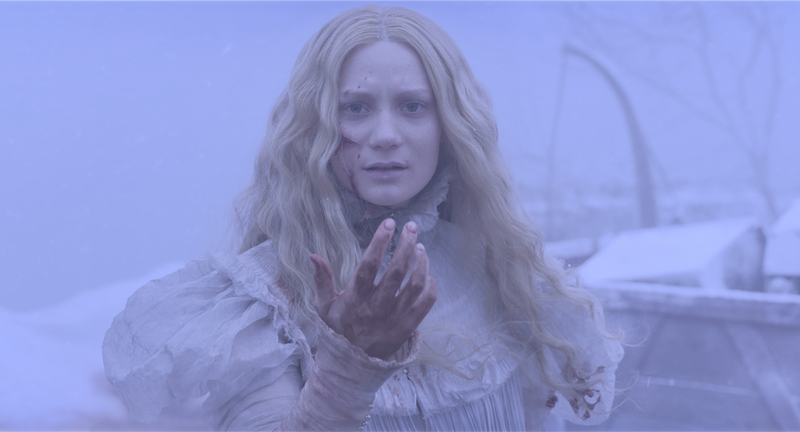 She’ll find out exactly what her mother meant when she told her to beware of Crimson Peak. What I think differs this movie from any other period piece or horror film in general is Guillermo del Toro‘s signature style. The ghosts in this film are unlike anything that has been done. They are decayed in a realistic sense but there’s an airy look to them, I just thought this was beautiful. The set design is exquisite. In a horror film, the sets are almost another character. I found myself constantly in awe, and fear, of how the house appeared, moved, and breathed. It was reminiscent of The Haunting, in terms of just being creepy and alive itself. I don’t want to give too much away because I really did enjoy this film, and although it’s not twist heavy, I think it would take away from the effect if all the beans were spilled. If you’re looking for a terrifying, non-cheesy horror film to see to get in the Halloween spirit, this is it. And as always, if you have any questions or comments feel free below!